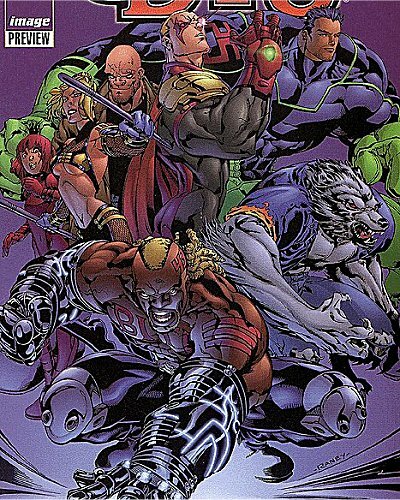 History: The Deviants (or DV8) are descendants of Team 7, the covert military strikeforce who were exposed to mutational chemical compounds by the intelligence community in order to make them superhuman. The Gen-Factor of superhumanity was passed on to Team 7s children. Those children therefore become International Operations targets, as Team 7 had gone into hiding. Some of this children -- now in their mid-to-late teens -- were rescued by rogue I.O. chief and Team 7 man John Lynch, and became the group Gen-13. DV8 were not. They are fully the creatures of crazed I.O. Science director Ivana Baiul. Therefore, what were looking at here is the antithesis of nice clean Gen-13. They stayed with IO. And they are not pleasant people. Brought together by the deliciously amoral Ivana Baiul, the group consisted of the heat-sucker Frostbite, the animalistic Evo, the multiple-personality possessor Copycat, the brawny Powerhaus, the density-altering Sublime, and the pain/pleasure controller Bliss. This motley group of disruptive teens was led by the arrogant psionic Threshold, with the utterly insane Sideways Bob acting as the team's "keeper". The group was formed and funded by Ivana once she was excised from International Operations to act as a "spoiler force", snatching up various technology and items before other intelligence agencies could get their hands on it, and then auctioning it to the highest bidder. Warren Ellis' opening run on the title was relentlessly nihilistic. The characters at no point seemed an amiable bunch, and with nary an altruistic gene among them. But Ellis' sharp writing and strong characterization made me interested to see if they'd discover a hint of humanity, a glimpse of promise, within themselves. For example, in the second issue Ivana sends them to investigate and possibly recruit a cult-like group of gen-active teens. When the DV8 members realize these people (with names like Virginia Dentata) are even more degenerate and twisted than themselves, they kill the lot of them - which of course was precisely what Ivana wanted in the first place. The members slowly realize they exist to be manipulated. As one character puts it, they're "like mushrooms, kept in the dark and fed crap." But it was fascinating to see how they each coped with their situation, particularly during "downtime". Sublime saves a girl from committing suicide by breaking her leg, Bliss begins a disturbing relationship with her brother Threshold, the ever-bored Evo wanders the streets seeking drugs to distract him. Not your basic "hero" behavior.